On the Day Tour, you can chose a 24 or 48 hour ticket and enjoy free inclusions such as the Dhow River Cruise and Dubai Museum. Both Day Tour routes provide a personal recorded commentary available in eight languages. 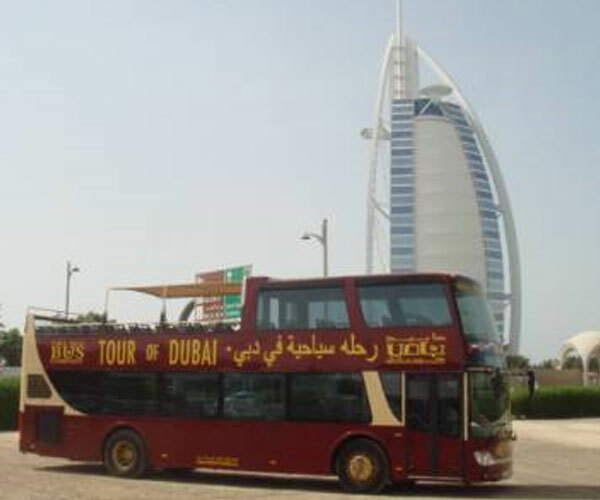 An ‘air-conditioned open-top’ bus sounds like a contradiction in terms, but Big Bus Tours acknowledges that Dubai’s warm climate would make some visitors reticent about spending a day on an open-top vehicle. The Big Bus fleet has therefore been designed to provide an air conditioned cabin on the first third of the upper deck. The air-conditioned cabin has large windows for uninterrupted views. The middle section is open air with a sun canopy, while the rear third is open to the sun for those wishing to enjoy the weather and a traditional open-top experience. Buses also have a fridge onboard and complimentary chilled, bottled water is provided for all customers. The Night Tour is a once round two-hour tour of Dubai with a live commentary from a qualified guide who will point out the highlights of this sparkling city. The Night Tour operates every night of the week. You can start the Night Tour from either of two locations: Deira City Centre at 7.30pm, returning at 9.30pm, or Souk Madinat Jumeirah at 8.30pm, returning at 10.30pm.